Dining with the Doc: Build a Better Burger- Take Two! Last week I flew off to Chicago to compete in this year’s Sutter Home Build a Better Burger competition. This was actually my second time competing as a finalist at BBB- the first time was back in 2008 when it took place at the Sutter Home winery in Napa Valley, California. 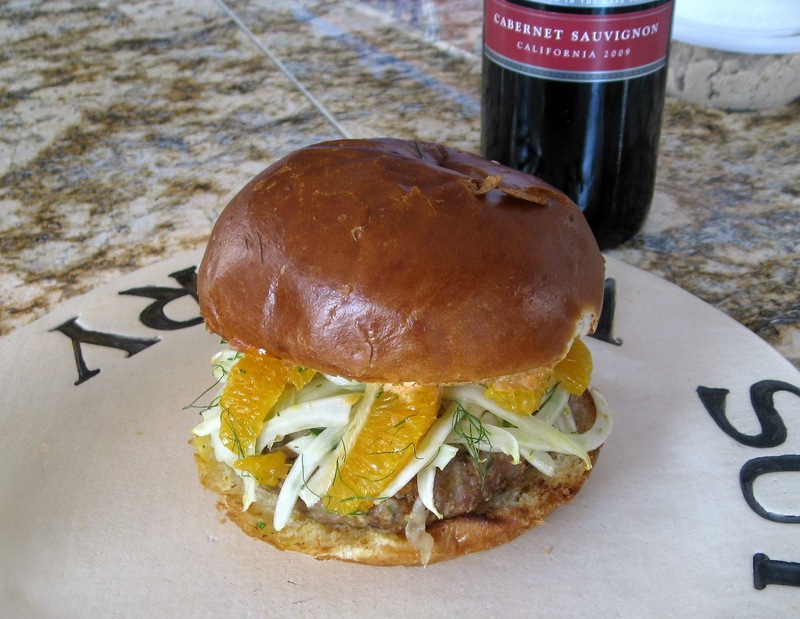 My “Valencia Pork Burgers with Fennel and Orange Slaw and Garlic Pimenton Aioli” were inspired by the wonderful trip to Spain that my husband and I took last year for our anniversary. We fell in love with Spanish cuisine, and I wanted to recreate some of our favorite flavors in a burger. I like combining sweet and savory flavors, and I think that the savory pork patties which are studded with salty Spanish olives are nicely complemented by the sweet oranges in the slaw. The fennel adds a nice crunch and the pimentón adds a slightly smoky flavor that ties all of the other components together. Unfortunately, I didn’t win the competition but I did have a great experience and met some wonderful people. And all of the finalists received new Kitchenaid standmixers, which was a nice surprise. Although my husband and I are all burgered-out for the time being, pretty soon I’ll get back in the kitchen and start testing out new burger recipes- Build a Better Burger 2012, here I come! To make the patties, combine all of the ingredients in a large bowl. Form into 6 patties, being careful not to overwork the meat. Make a slight indentation in the center of the patties so that they will cook evenly. Cover and refrigerate. To make the aioli, combine all of the ingredients in a mini food processor and blend until smooth. Cover and refrigerate until ready to assemble the burgers. To make the slaw, first juice enough of one of the oranges into a medium bowl to equal 3 tablespoons. Set aside. Cut the tops and bottoms off the remaining 2 oranges, then slice off the skin, following the curve of the fruit. Slice out each of the orange segments and place them in a medium bowl. Using a mandoline set on the thinnest setting or a very sharp knife, thinly slice the fennel bulb into rings. Add the sliced fennel, fronds, and parsley to the orange segments. Whisk the vinegar together with the reserved juice. Slowly whisk in the oil. Season with the salt. Pour the dressing over the slaw and toss to combine. Cover and set aside until assembling the burgers. Brush the grill rack with vegetable oil. Place the patties on the rack, cover, and cook until cooked through, 4 to 6 minutes on each side. During the last 3 minutes of cooking, place a slice of cheese on each patty. During the last 2 minutes of cooking, place the rolls, cut side down, on the outer edges of the rack to toast lightly. To assemble the burgers, spread some of the aioli on the cut sides of the roll tops. Place a cheese-topped patty on each roll bottom and top with a mound of slaw. Add the roll tops and serve.